Huge numbers of people take a multivitamin, but the potencies of the individual nutrients are usually so trivial that no health benefit is derived. The ultra-low cost of Life Extension One-Per-Day makes it one of the great bargains on the dietary supplement marketplace. 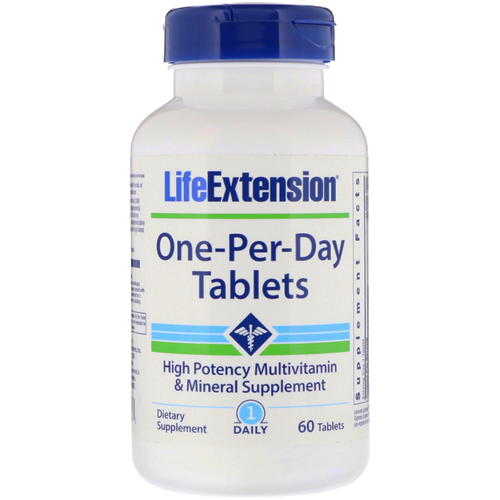 Life Extension One-Per-Day Tablets now contain three potent forms of selenium (SelenoExcell, Se-methyl-selenocysteine, and sodium selenite). Also included is apigenin, a powerful bio-flavonoid found in many vegetables and fruits which boosts cell protection. Life Extension One-Per-Day Tablets provide Crominex 3+, a highly stable and biologically active form of chromium blended with Capros Amla and PrimaVie Shilajit. When used as part of a healthy diet, chromium plays a vital role in maintaining healthy blood sugar levels in those within normal range. One-Per-Day Tablets additionally contain alpha-lipoic acid, the universal antioxidant that helps boost glutathione levels already in normal range. Life Extension's One-Per-Day formula contains the form of vitamin D known as cholecalciferol (vitamin D3). It also contains bioactive forms of vitamin B2, vitamin B6 and folate, zinc citrate and natural mixed tocopherols. 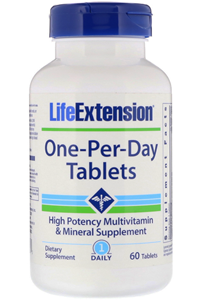 Life Extension's One-Per-Day contains 5-methyltetra-hydrofolate (5-MTHF), the active form of folate that is up to 7 times more bio-available than folic acid. This greater bio-availability is especially important in people with a genetic enzyme deficiency since it requires no conversion to become metabolically active. Read the entire label and follow the directions carefully prior to use. Take one (1) tablet daily with meals, or as recommended by a healthcare practitioner. Croscarmellose sodium, stearic acid, vegetable stearate, aqueous film coating (purified water, hydroxypropyl methylcellulose, glycerin), microcrystalline cellulose, maltodextrin, silica. Individuals consuming more than 2,000 iu/day of vitamin D (from diet and supplements) should periodically obtain a serum 25-hydroxy vitamin D measurement. Vitamin D supplementation is not recommended for individuals with high blood calcium levels. Store tightly closed in a cool, dry place. Keep out of reach of children. Do not exceed recommended dose. Do not purchase if outer seal is broken or damaged. When using nutritional supplements, please consult your physician if you are undergoing treatment for a medical condition or if you are pregnant or lactating.